Parathyroid Hormone (PTH) Levels: Why are mine all over the map? Parathyroid hormone (PTH) levels are typically steady and constant in the patient with normal parathyroid glands, but a parathyroid tumor can make PTH levels jump around in a chaotic, disorderly fashion. This PTH variability routinely confuses doctors and patients. I spoke with Margaret, a chipper little 68-year-old lady from Arizona, and her husband, Gene-both are Diamondbacks fans. Ha, this was going to be an uphill battle! Margaret had high blood calcium and osteoporosis for several years, but she and her doctor were very confused by her fluctuating parathyroid hormone levels. We see parathyroid hormone levels serve as the source of great confusion in trying to diagnose primary hyperparathyroidism on a daily basis. She has had high blood calcium levels (10.5-11.0 mg/dl) for at least seven years. Her parathyroid hormone levels have been all over the map. At first her high blood calcium was associated with parathyroid hormone levels of 110 and 88 pg/ml. Her primary care physician was excited, patting himself on the back for diagnosing primary hyperparathyroidism. "I've never had anybody with this disease in my practice!" Uhm, that's not likely, but that's an entirely different blogpost! Off to the endocrinologist she went. What she got from her endocrinologist was not unusual to get from an endocrinologist: orders for a bunch of tests. Included in these tests were repeat calcium and PTH levels (and an assortment of other tests…) The calcium level was still high (10.9), but the parathyroid hormone level was now 63 pg/ml. Like magic it was back down to normal again. "You can't have a parathyroid tumor when your parathyroid hormone level is normal. Come on back in six months, but in the meantime take this Fosamax for your bones". Note, this is one of the 10 most common mistakes doctors make when diagnosing hyperparathyroidism as discussed in another recent blog. It's a parathyroid tumor. 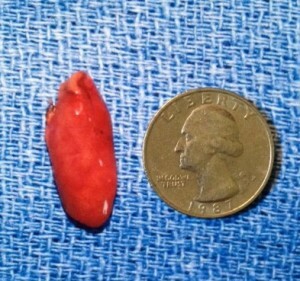 It's not a normal parathyroid gland… so let's not expect it to act normally. Parathyroid hormone levels produced by a tumor follow their own set of rules! If I take blood from a normal person who does not have parathyroid disease and test it for parathyroid hormone levels, those PTH levels will not fluctuate much at all. Let's say we do it for eight straight days. Those PTH levels will be something like 24, 24, 28, 27, 25, 27, 26, and 28 (pg/ml). Remember that this person doesn't have parathyroid disease. This person has 4 normal parathyroid glands, and those 4 normal parathyroid glands are filled with normal parathyroid cells that are incredibly efficient at keeping parathyroid hormone levels in a nice, tight, constant range-hence the lack of fluctuation. OK, so now let's take a person who has a parathyroid tumor. This person will have parathyroid hormone levels that are the result of a tumor with a mind of its own, so to speak. 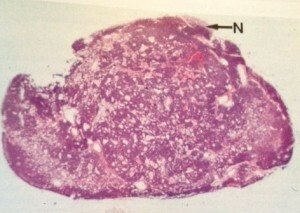 The tumor is filled with abnormal cells-millions of copies of one abnormal cell. These cells are abnormal, thus they do not perform in a normal way. They dump parathyroid hormone out into the bloodstream at random intervals. The high blood calcium level suppresses the other three normal parathyroid glands, so they produce very little parathyroid hormone (as they should) since the parathyroid hormone level of a patient with a parathyroid tumor is at the mercy of this tumor (that is made up of all of these abnormal cells!) One will see parathyroid hormone levels that jump around all over the place, just like Margaret's did. You won't see the nice constant PTH levels in the mid-20s. You will see a PTH level of 110, then down to 88, sliding further to 63 only to bounce back up to 76, then back down to 58, finally shooting up to 101. All of this chaos is the result of a tumor that has lost its control mechanism! I vote to remove it! Let's take another example. Parathyroid hormone levels in patients that do not have a parathyroid tumor will usually run between the 20's and 40's and remain fairly constant (as we have discussed already). In the presence of high blood calcium level, however, normal parathyroid glands (made up of normal parathyroid cells) should shut down production of parathyroid hormone. This occurs within minutes. Parathyroid hormone only has a half-life of around eight minutes. Let's do an experiment: take Gene, Margaret's husband, he's not doing anything. Give him 15 calcium pills to take. Of course, this is inadvisable, but it works for our example here. Gene has 4 normal parathyroid glands. Let's wait about 2 hours (give his intestines plenty of time to absorb as much of this extra calcium as they can). Then let's draw his blood and measure the calcium and the parathyroid hormone levels. The calcium will be high (obviously, he just took 15 calcium pills!). The parathyroid hormone level will reflect 4 normal parathyroid glands that are suppressed by the high blood calcium. Thus his parathyroid hormone level will be near zero. It will be about 6, 2, or 4, something in the single digits (pg/ml). So when Margaret had a high blood calcium level (remember that Margaret had a parathyroid tumor, not 4 normal parathyroid glands), her parathyroid hormone levels were sometimes called "normal" because they were in the "normal range". Her PTH was 58 and 63 which is in the normal range but it is "inappropriately normal", meaning it wasn't shut off… it wasn't near zero. The astute physician will know that the parathyroid hormone levels must be interpreted in conjunction with the calcium level. It's amazing that it's 2013 and the laboratory's computers don't just spit this stuff out, right? Parathyroid hormone levels throw our colleagues for a loop on a daily basis. When you understand the things that are explained here, it actually makes perfect sense. The continued production of parathyroid hormone in the setting of high calcium that should suppress those parathyroid glands represents autonomous production of parathyroid hormone. What produces PTH on its own, when and how it wishes (i.e.., autonomously)? 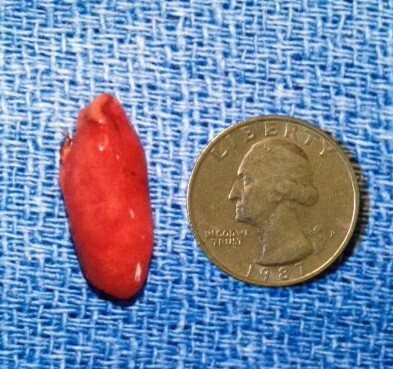 A parathyroid tumor. Get rid of it! Margaret is happy to report that her blood calcium and parathyroid hormone levels are both normal. But now they should be normal! Now, if I can just cure her of being a Diamondbacks fan! 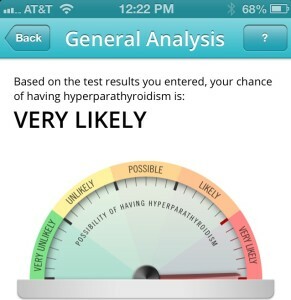 See our Advanced Diagnostic page of parathyroid.com. Dr. Doug Politz is one of the world's most knowledgeable parathyroid doctors and the second most experienced parathyroid surgeon in the world. Dr. Politz attended LSU Medical School where he graduated with the Chancellor’s Award as the Most Outstanding Graduate. Dr. Politz obtained his surgical training at the University of South Florida in Tampa, working with Dr. Norman for 5 years. Doug is a member of over a dozen surgical societies and is a fellow of the American College of Surgeons (FACS) and the American College of Endocrinology (FACE). He has been awarded the "Patients Choice Award" 8 consecutive years (top 3% of all American doctors), has been named one of America's Top Surgeons annually for over a decade. Dr. Politz has been a senior surgeon at the Norman Parathyroid Center since 2005 and has dedicated his surgical career to the treatment of hyperparathyroidism.